There are some pretty awful things going on in the world right now that are not all ages appropriate. They should not be for any age, and yet they are and we must deal with them and children must deal with them and it really isn’t fair. @MaxCCurtis replied with something from The Doctor Falls, the most recent Dr Who episode. 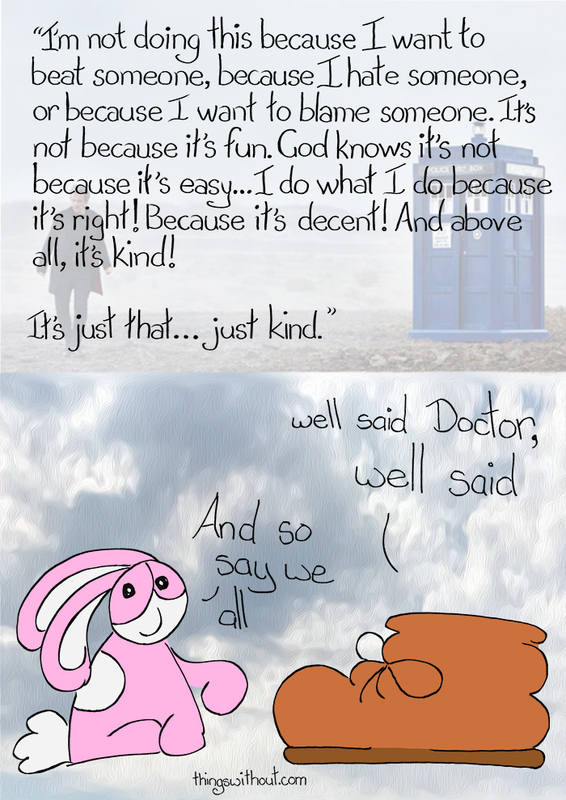 The Doctor Falls hit me in the feels when I watched it. It’s not often you see someone standing up for the right thing in what seems like a hopeless battle and calling upon the words of kindness. It’s not fancy, or showy (though Dr Who can be showy), but when it’s all stripped down to it, it’s about a moral courage that does not need fireworks. Kindness is not the same as nice as we’ve said before. There are so many difficult conversations that are hard to have that are risky, not nice, but very kind (even if not treated as if they are kind). “I’m not doing this because I want to beat someone, because I hate someone, or because I want to blame someone. It’s not because it’s fun. God knows it’s not because it’s easy… I do what I do because it’s right! Because it’s decent! And above all, it’s kind!